Ford Bronco Forum > Bronco Discussions > 1980-'96 Bronco Tech > Heater upgrades? I’ve thought about adding one of these. My 85 heat will drive you out but the 86 heat is so so. I'm all about the remote-start setup. That and a quality alarm with multiple options will be among the first things I do to my Bronco. Along with tons of vibration dampening materials everywhere and a nice sound system. 3G Alternator. I'm not familiar with that term. I Googled it but am not clear on it. Is the only difference just the higher wattage rating? An HO alternator is a must-have for any decent sounds system. Along with upgrading battery and ground cables to a better quality and thicker awg wire. I like how this thread is also delving into cooling. I'd definitely like to hear thoughts on upgrading the cooling capacity as well. The "block" plate sounds intriguing but dangerous. I'll make sure to research it! Interesting. 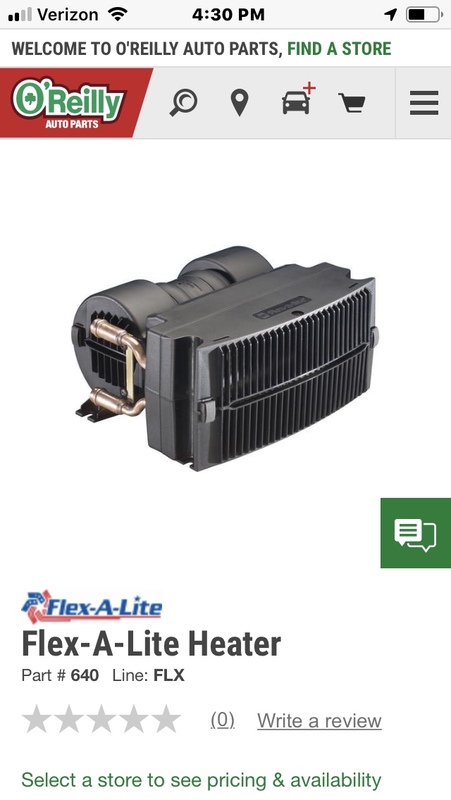 So this flex-a-lite heater takes the place of the original heater core? I would see it supplementing but it might replace. There are add ones as well. 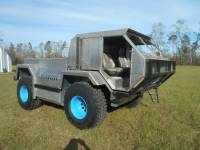 I had a mid 70s FJ40 Lancruiser and it had a cool little extra Hester in the back. Worked great. Same idea as the FL. The 3G is the best alternator design is perticularly good at low rpm charge. There are a couple threads in the tech section on it. There are other alternators that make more amps, but are not good at idle. The block is just plastic or sheet metal. If you have a later model Bronco, you already have it. I got one out of a later F150, but it would be easy to make. There is a TSB by Ford on this subject. I'm sure Miesk5 can fill you in on it. You add that heater, not replace yours. Most likely in the back. Bronco Info: 1995 Xlt 5.8l 351w with e4od and electronic shift. Manual locking hubs. I've been toying with cutting some holes in one of the high end center consoles and seeing how i could tie into the existing hvac system and pump air to the rear part of the truck. I think I was looking at the expedition or the excursion. I don't remember. Since they extend to the dash, hiding a pipe would be easier. Im not sure why I missed this thread before. My 92's heat was so-so for years after I got it until the heater core popped and I replaced it and flushed the cooling system. Ever since then I have been genuinely concerned that if I leave the heat on high for more than 15-20 minutes im going to start melting dash vents. Its HOT! 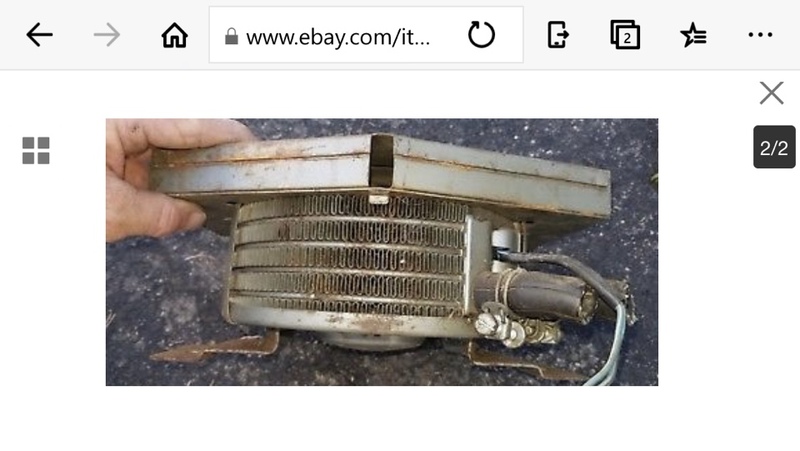 I also replaced the core with an OEM unit and have been trouble free for years now, after 6 years in aftermarket parts I learned the cheap replacements are junk. miesk5 and CZ Eddie like this. Rotate temperature control knob from the full cool position to the full warm position and check operation of the temperature control door. Does the temperature control door operate correctly? Yes	CHECK drive belt for proper tension or signs of slippage and wear. REPAIR or REPLACE as necessary. RETEST system. No CHECK temperature control door for a binding condition. Also CHECK the A/C temperature cable for connection to the temperature control door and A/C control. REPAIR or REPLACE as necessary. RETEST system." Drive belt chirp is a regularly occurring chirping noise that occurs due to pulley misalignment or excessive pulley runout. It can be a result of a damaged pulley or an improperly replaced pulley that was not properly aligned. To correct, determine the area where the noise comes from. Then check each of the pulleys in that area with a straightedge to the crankshaft pulley (6312) and look for the accessory pulleys to be out of position in the fore/aft direction or at an angle to the straightedge. Belt squeal is an intermittent noise that occurs when the drive belt slips on a pulley during certain conditions such as: engine start-up, rapid engine acceleration, or A/C clutch engagement. The A/C system is overcharged. The A/C condenser core airflow is blocked. The fan blade (8600) is not engaging fully at idle. If A/C OFF equalized pressure (the common discharge and suction pressure that occurs after several minutes) exceeds 965 kPa (140 psi), which is a rare occurrence at high ambient temperatures with a hot engine, turn A/C off for a few seconds and then back on after fan blade begins to cool A/C condenser core. If any of the accessories are damaged, or have a worn or damaged bearing or internal torsional resistance above normal for any reason. All of the accessories should be rotatable by hand in the unloaded condition. If any are not, the accessories should be inspected. If fluid gets on the drive belt. Fluids include power steering fluid, engine coolant, engine oil or air conditioning system lubricant. If fluid does get on the drive belt during service, the best policy is to clean the drive belt with soap and water and thoroughly rinse with clean water. The drive belt does not have to be replaced if no apparent damage has occurred. If drive belt is too long. A drive belt that is too long will allow the drive belt tensioner arm to go all the way to drive belt tensioner arm travel stop under certain load conditions, which will untension the drive belt. If the drive belt tensioner (6B209) is resting on the stop, replace the drive belt. If the drive belt tensioner is worn or damaged. The drive belt tensioner arm should rotate freely without binding." "Before servicing the climate control system, perform a visual inspection of components. Check all refrigerant line connections for indications of leaks. A refrigerant leak will usually appear as an oily buildup at the point of the leak. This is caused by refrigerant escaping through the faulty connection. As the refrigerant escapes, a minimal amount of refrigerant oil escapes along with the refrigerant. Over time, this refrigerant oil collects around the refrigerant leak and will take on the appearance of a dirty/oily deposit. In addition to visual inspection of the refrigerant lines, the drive belts (8620) should also be examined for evidence of age and wear. Look for signs of cracks and fraying on the drive belts. Drive belt tension should also be checked. Drive belts showing signs of wear should be replaced." "When the temperature control knob is moved to the extreme WARM (fully clockwise) position, all air is directed through the heater core. When the temperature control knob is between COOL and WARM (between full counterclockwise and clockwise), air is directed through and bypassing the heater core in rough proportion to the position of the temperature control knob between the extremes of its travel." The A/C refrigerant of all vehicles must be identified and analyzed prior to refrigerant charging. Failure to do so can contaminate the shop bulk refrigerant and other vehicles. Do not add R-12 refrigerant to an A/C system that requires the use of R-134a refrigerant. These two types of refrigerant must never be mixed. Doing so can damage the A/C system. R-134a must not be mixed with air for leak testing or used with air for any other purpose above atmospheric pressure. R-134a is combustible when mixed with high concentrations of air and higher pressures. CAUTION: A number of manufacturers are producing refrigerant products which are described as being direct replacements for R-12. The use of any unauthorized substitute refrigerant may severely damage the A/C components. If service is required, use only new or recycled R-12. NOTE: The engine should be run at idle for 10 minutes with the air conditioning on and set to MAX A/C before carrying out this retail procedure. Coolant reservoir for correct coolant level. Heater hoses for deterioration or loose connections. Radiator and condenser for debris or damaged fins restricting airflow, loose mounting or connections. Accessory drive belt(s) and cooling fan(s) for wear or physical damage. Refrigerant lines and connections for physical damage or loose connections. Compressor for physical damage or loose connections. Suction accumulator/drier for physical damage or loose connections. Wiring and connectors for excessive wear, loose or damaged connections, or incorrect routing. Carry out air conditioning refrigerant analysis as outlined in TSB # 98-12-08. If the refrigerant fails the analysis, discontinue diagnosis and make recommendations for repairs. If the refrigerant passes the analysis, carry out the air conditioning system check. Connect manifold gauge set or charging station with gauges to refrigerant system. With the vehicle in park, parking brake set, thermometer installed in center panel vent, and air conditioning system on and set to MAX A/C, start the engine. Record air refrigerant system pressures while running the engine at 1500 RPM and allow engine to return to idle. Operate the blower motor in all control positions and check for correct blower speed changes. With the blower motor on HI, operate air discharge mode selector in all positions and check for correct airflow in each position. Operate the temperature blend selector in all positions and check for correct change in discharge temperature. Check the air discharge temperature with the selector in the coolest position and the air conditioning on and set to MAX A/C to determine if the air discharge temperature is acceptable for the current ambient air temperature. Carry out the EATC self-test (if applicable). If the refrigerant system pressures were low, carry out the refrigerant system leak test. Pre-1995 vehicles - Use an electronic leak detector to check for leaks at all refrigerant lines, connections, and components. 1995 and newer vehicles - Use either an ultraviolet (UV) or an electronic leak detector to check for leaks at all refrigerant lines, connections, and components. After all tests have been completed, report all findings and recommended repairs to your service advisor before carrying out further diagnostic procedures." Periodically inspect the front of the condenser for bent fins or foreign material (dirt, bugs, leaves, etc.). If any cooling fins are bent, straighten them carefully. You can remove any debris with a stiff bristle brush.